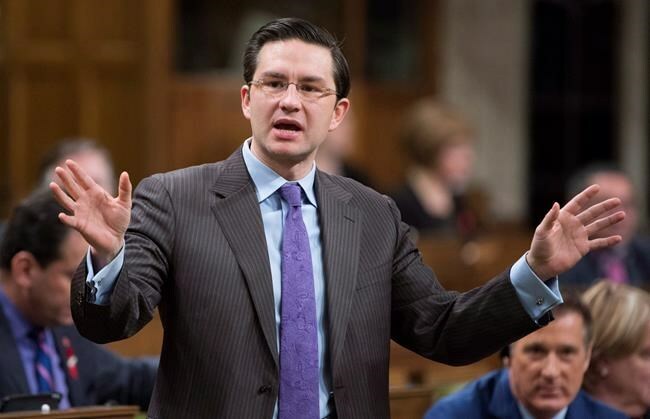 OTTAWA — Conservative finance critic Pierre Poilievre will ask the House of Commons this week to force the government to show Canadians how much more they can expect to pay for gas, heat and groceries once every Canadian will be charged a $50 per tonne carbon tax. Poilievre says he knows the government has the information because access to information requests he filed produced a finance department memo that says there is an analysis of the potential impact of a carbon price, based on household consumption data across different income levels. However, he says the actual data from the analysis is blacked out. Poilievre says he has given notice of the intention to file a motion demanding the government table documents in the House that show how much a $50 per tonne carbon price will cost a median income Canadian family. The federal government requires every province to put a price on carbon by the start of next year or it will impose one itself. Legal authority to do so is laid out in the government's budget implementation bill currently working its way through Parliament. Poilievre says the carbon price legislation takes up 200 pages of that bill, but nowhere does it say how much it will cost people. "Government cannot tax what Parliament does not approve, but Parliament cannot approve what it does not know," Poilievre said Sunday. "Right now, Parliament is being kept in the dark." In refusing to provide the analysis done by the department of finance, the government says it can be withheld because it is either advice to government or information that can possibly harm the Canadian economy. "If the knowledge of the cost of the carbon tax in itself would cause injury to the Canadian economy, then that cost must be even worse than we have imagined," said Poilievre. He also filed a complaint with the information commissioner, asking her to investigate the government for its refusal to release the information in the access request response. He said Caroline Maynard has agreed and has started looking into the matter. Four provinces already have carbon pricing systems in place, but the federal requirement will mean on January 1, every province has to have a system that applies a price of at least $20 per tonne of carbon emissions. The price has to rise $10 per tonne per year until it reaches $50 per tonne in 2022. At that point, Ottawa will review the system. The documents outlining the proposed federal pricing system, to be used only in provinces that don't have their own plan, do provide information about what impact the price will have to the cost various types of fuel such as gasoline, natural gas, propane and coal. However, Poilievre says it's not detailed enough for individual families to understand what it means to them, because the price will not only affect the price at the pump but most of what people buy as the cost to produce and ship products also goes up. Environment Minister Catherine McKenna said Sunday a price on carbon has a low cost and high impact. "We know polluting isn't free — there is a cost," said McKenna. She said carbon pricing pushes for innovation to find ways to reduce emissions in order to pay less, and is one of the ways Canada will meet its international commitment to reduce climate-changing emissions. McKenna has also been criticized for not answering questions about how much emissions the carbon price will cut. "We will be releasing more information shortly," she said Sunday. The Pan Canadian Framework on Clean Growth and Climate Change estimates 86 million tonnes of emissions will be eliminated in Canada from the measures contained within, but it does not specify how much of that is to come from carbon pricing.